The Kinsman/Central neighborhood on Cleveland’s east side has long been regarded as one of the poorest areas in the city—perhaps even the state—with little direction or hope for revival. But with the help of nonprofit neighborhood development organization Burten, Bell, Carr Development (BBC), this once-thriving neighborhood is rediscovering its potential. Founded in 1990 to empower citizens and revitalize blighted and underserved areas, BBC has worked tirelessly to set Kinsman/Central on a positive trajectory—employing what executive director Tim Tramble calls a "multi-pronged" approach to community revitalization by enlisting a wide array of community partners to put dynamic projects in motion. Almost two decades later, the organization is starting to see the work pay off. In light of its efforts, a community that many have disregarded as a lost cause is pulling itself up by the bootstraps and creating a pocket of Cleveland that is making strides in economic development, housing, and even farming. The intersection of E. 81st Street and Kinsman Road is slated to play home to one of the most innovative projects shaping the future of Kinsman: BoxSpot. Comprised of seven recycled shipping containers, the 50,000-square-foot facility will feature entrepreneurial retail stores and kitchens surrounding an open-air market and community space. “Six of the containers will be used for office space, and one will be common space or a shared conference room,” says Tramble, adding that the $1 million development will also house a stage for outdoor concerts and community events. BBC gained approval for the complex in April from Cleveland City Council’s planning committee. Designed by Architecture Office, BoxSpot is scheduled for completion by the end of the year. Prior to launching the BoxSpot project, BBC launched Arbor Park Place in 2005. 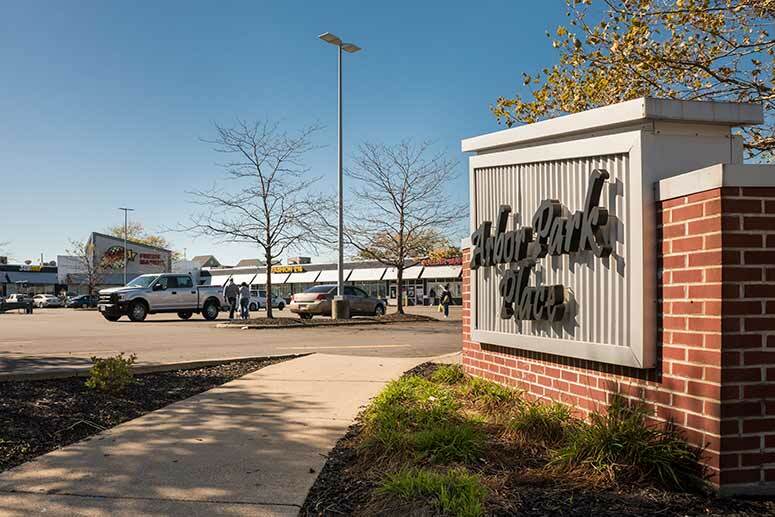 The first large-scale retail development in Central in more than 40 years, the project entailed a $6.2 million redevelopment of Longwood Plaza at Community College Boulevard and E. 40th Street. Arbor Park Place now houses a Dave’s Supermarket and locally-owned El Dorado Barber Shop. Bridgeport Place, a $2.2 million, 13,200-square-foot retail and commercial complex at Kinsman Road and E. 72nd Street, followed in 2008. Bridgeport Place houses BBC’s offices; Cleveland Public Library Garden Valley branch, complete with 21 computers; the Bridgeport Café for healthy, local meals; and CornUcopia Place, a food-centric community center providing nutrition education, cooking demonstrations, and a hub for local gardeners. In addition to the broadcast studio, WOVU features a classroom where residents can learn how to produce their own radio shows. “They can learn about engineering and what’s involved with radio,” promises Liston. CornUcopia Place is just one way BBC has taken steps to eliminate Kinsman’s ranking as a food desert by the U.S. Department of Agriculture. Today, the neighborhood is rich with healthy eating options, as well as an unusual amount of gardens and fruit trees. 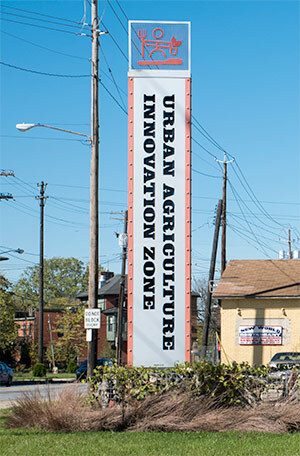 A 28-acre stretch of land on E. 81st Street and Otter Avenue is now deemed the Urban Agriculture Innovation Zone—one of the more ambitious projects taken on by BBC. This tract of land is in what is known as “the forgotten triangle,” running from Woodland Road to the north, Kinsman Road from the south and west, and the railroad tracks off of E. 84th Street. The decision to convert it to an urban agriculture zone came about in 2005 when BBC was developing its original master plan. The organization developed a new master plan in 2016. While BBC conducted a feasibility study, Rid-All Green Partnership took over 1.5 acres of the property (and is set to assume another 1.5 acres soon). To date, they have harvested 14,000 pounds of produce; raised 350 pounds of tilapia; and cultivated 1,200 cubic yards of compost. 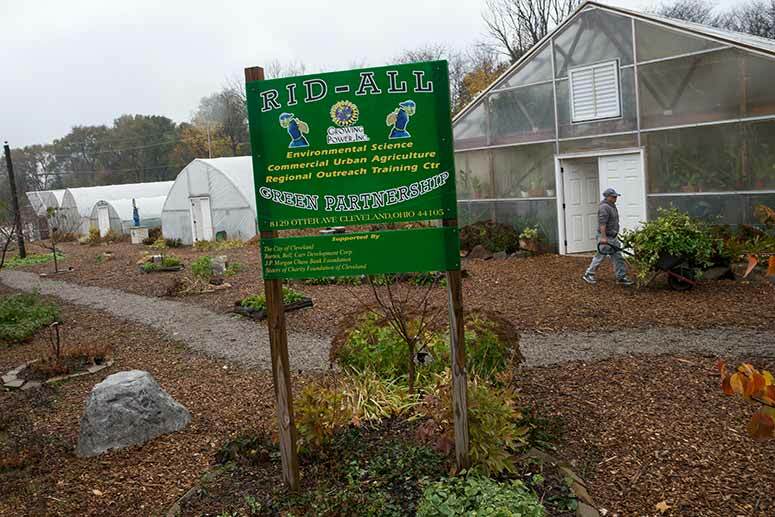 Today, Rid-All Green Partnership has four full-time employees and has trained over 150 people in urban agriculture techniques. Meanwhile, the Ohio State University Extension also operates six acres on Kinsman Farm, where students who take market gardening classes and develop a business plan can then grow on a quarter-acre parcel. “We’ve had a lavender farmer [and] soul food chefs grow there,” says Sugalski. “Our goal is to do the 28 acres of the urban agriculture zone with different agricultural uses.” He says there will still be 15 acres available after the Northeast Ohio Regional Sewer District completes its Green Infrastructure project on the site. Outside of the Urban Agriculture Zone, BBC has worked with community organizers to convert many desolate spots in Kinsman into vibrant, flourishing areas. For example, the Four Corners Orchard (at E. 76th Street and Colfax Road) is lush with peach, pear, apple, and cherry trees. Urban farmers are thriving independently elsewhere in the Kinsman/Central neighborhood, further helping erase the food desert status, such as Tanya Holmes’ Ka-La Healing Garden on E. 73rd Street in Central. 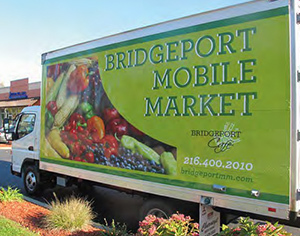 In an effort to makes sure all Kinsman/Central residents have access to locally grown produce, BBC launched the Bridgeport Mobile Market in 2013—a refrigerated truck stocked with healthy foods and produce that travels the area each week. Kinsman's vast transformation has also lent itself to beautification. Case in point: the E. 79th Street RTA Rapid station, which sits just off what was an abandoned two-acre park. In 2013, with the help of a grant from Cleveland Neighborhood Progress’ Reimagining Cleveland program, the Hillside Community Park was transformed with 400 plants and flowers, planters, benches, and mulched areas. A walking path from the Rapid station and an outdoor classroom are just some of ongoing plans for the park. Meanwhile, some developers see a Gateway to Nature project evolving along the neighborhood’s portion of Kingsbury Run—a once-industrial hub and watershed—right along the Opportunity Corridor. The project that will bring Kinsman full circle includes housing for all residents. Since its inception, BBC has focused on developing and maintaining market-rate and subsidized housing in the Kinsman/Central neighborhood—having created more than 750 units over 17 years (400 of which are single family homes). BBC has worked with the Cuyahoga Land Bank to demolish abandoned houses to make way for updated, affordable living options and greenspace. In July, BBC was awarded $8.25 million in housing tax credits from the Ohio Housing Finance Agency to build Colfax Family Homes—36 single family housing units targeted toward working families with household incomes of 45 to 60 percent of the area’s median income. Tramble says construction is scheduled to begin in Fall 2018. A senior living center project is also planned along E. 79th Street and Kinsman Road. While BBC is proud of its progress on the Kinsman/Central neighborhood, no one involved feels that the effort has reached the finish line. 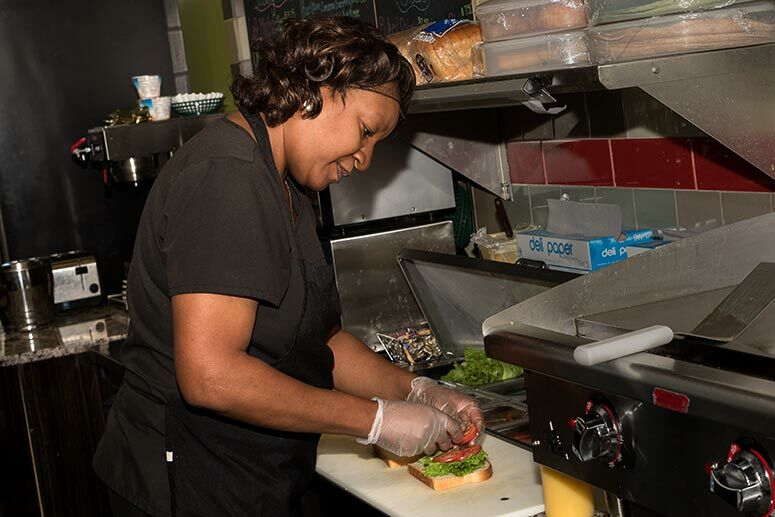 Poverty conditions persist—the neighborhood remains one of the poorest in the state—but the small steps are adding up to a renewed sense of community pride. Tramble says the organization must harness that momentum and keep marching onward.